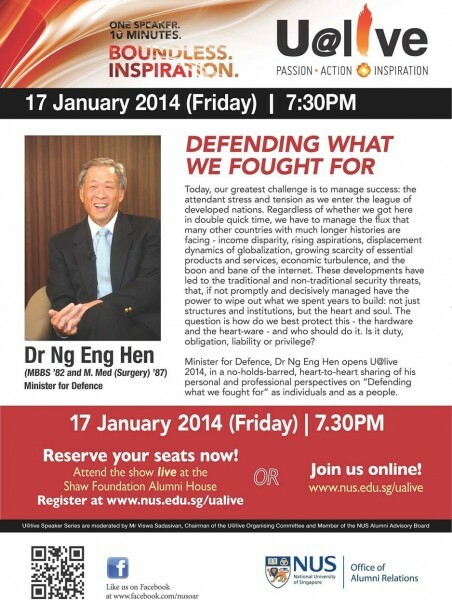 HomeU@live with Dr Ng Eng Hen! U@live with Dr Ng Eng Hen! Minister for Defence, Dr Ng Eng Hen opens U@live 2014, in a no-holds-barred, heart-to-heart sharing of his personal and professional perspectives on “Defending what we fought for” as individuals and as a people. A unique feature of U@live is that not only will it be viewed by a live audience, it will be streamed live through a dedicated website (www.nus.edu.sg/ualive). The event will also incorporate a new interactive application that allows users to post questions and vote for their favourite questions in real time. The event will consist of a 10-minute talk by the speaker followed by a 20-minute interview conducted by Mr Viswa Sadasivan and a 30-minute Q&A session open to the live and online audience. We sincerely hope that you will be able to join us for this event. Go here to register!